Baker Street and Bayswater complete MINI London editions? Do you remember the Classic Mini Mayfair, Ritz, Chelsea, Piccadilly and Park Lane special editions of the 80's? Well, it would appear that BMW is keen to complete the set, with the introduction of Baker Street and Bayswater special editions of the current MINI. Go for the Baker Street and it is finished in exclusive rooftop grey metallic paint, with bonnet stripes with a subtle V-shape. At the side, "Baker Street" lettering is fitted to the side scuttles and door sills. Other exterior changes include black '6-star' twin-spoke alloys, matching black mirror caps and even a black roof on Cooper models. Move inside the MINI Baker Street and there are cloth/leather seats with exclusive diamond trim, Cross Check Rooftop Grey trim for the dashboard and door trims. Finally a subtle, but neat touch is the contrasting light grey stitching for the floor mats, gearstick and handbrake gaiter. On top of the MINI Baker Street's exclusive equipment, it is fitted with the Pepper Pack which includes automatic air-conditioning, Bluetooth and an on-board computer. 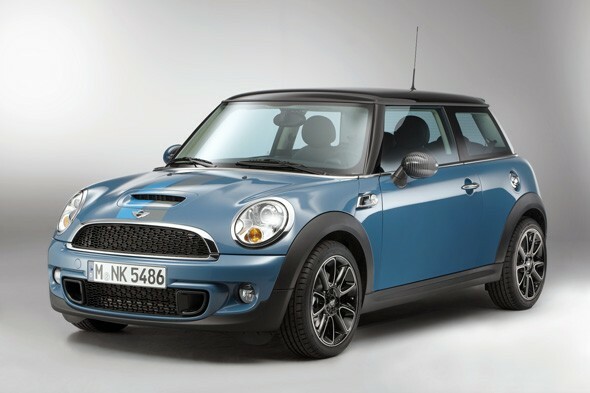 The MINI Bayswater seems the more eye-catching of the two, with its Kite Blue metallic paint, the black 17-inch "Sandblast" alloys and the blue/grey sport stripes on the bonnet. With Midnight Black metallic and Eclipse Grey metallic available as alternative body colours on Cooper S and Cooper SD versions. Inside, the Bayswater's interior includes Chrome Line and Chili packages as standard, but unique features include the punch leather seats which are finished in Rocklike Anthracite and side bolsters, sporting a unique metallic sheen with blue and grey contrasting stitching and 'Bayswater' seat tags. Other special Bayswater interior features include the include Piano Black trim, which continues the colour scheme of the Sport Stripes on the bonnet. The floor mats are unique to this car and have anthracite-coloured edging with blue contrasting stitching. Both are available for a limited period in all 100 markets where MINIs are sold; they go on sale at the beginning of March for a limited period.